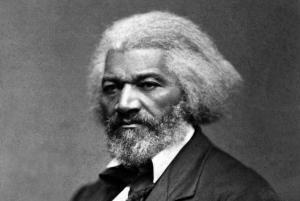 On February 14, 1817, the great Abolitionist and former slave, Frederick Douglass was born. Including ex-slave as a descriptor is important, since Douglass was one of the first to write about his experience as a slave in the US with his first autobiography, Narrative of the Life of Frederick Douglass, in 1845. The publishing of this autobiography by Douglass came about in part because Douglass would often encounter disbelief from White audiences about his former slave status, because he spoke so eloquently in public. Privileged White audiences, it seems, had a hard time believing that a Black man could use language in such a powerful way, but it was Douglass’ own experience of slavery that gave him the ability to articulate an abolitionist message. Frederick Douglass was one of the seminal figures of the 19th Century Abolitionist movement, not just because he was an ex-slave, but because he was a tireless organizer who challenged not only chattel slavery, he challenged institutional racism that was at the very foundation of this nation. As the battle to end Chattel slavery continued, Douglass not only became one of the strongest voices for abolition, he was deeply involved in the multi-pronged efforts to dismantle legalized slavery. Douglass not only documented the abolitionist movement in his publication The North Star, the former slave challenged the White anti-slavery sectors to do more than take a moral position against slavery. Douglass supported and was involved in the Underground Railroad, mostly through speaking, writing and raising money for those doing the dangerous work. Douglass was also constantly slapping America upside the head by framing the issue as one of urgency and liberation. There were those at the time who advocated for a reformist approach and to “not ask for too much too soon,” but Douglass would constantly remind his audience that nothing short of the immediate abolition of slavery was acceptable. Indeed, while Douglass may not have fully agreed with the militant responses to legalized slavery from Nat Turner or John Brown, he recognized that this kind of resistance was inevitable if change didn’t come immediately. This struggle may be a moral one, or it may be a physical one, and it may be both moral and physical, but it must be a struggle. Power concedes nothing without a demand. It never did and it never will. Find out just what any people will quietly submit to and you have found out the exact measure of injustice and wrong, which will be imposed upon them, and these will continue till they are resisted with either words or blows, or with both. The limits of tyrants are prescribed by the endurance of those whom they oppress. We celebrate Frederick Douglass today because he was one of the first men to stand in solidarity with women who were organizing for their own liberation. Douglass understood the importance of inter-sectionality and that oppression was wrong no matter what form it took. He wrote the following words in support of women’s rights in the immediate aftermath of the Seneca Falls Convention. In respect to political rights, we hold woman to be justly entitled to all we claim for man. We go farther, and express our conviction that all political rights which it is expedient for man to exercise, it is equally so for women. All that distinguishes man as an intelligent and accountable being, is equally true of woman; and if that government is only just which governs by the free consent of the governed, there can be no reason in the world for denying to woman the exercise of the elective franchise, or a hand in making and administering the laws of the land. Lastly, we celebrate the birth of Frederick Douglass because he understood the importance of independent media (The North Star) and the practice of journalism that exposed power.